I grew up in Bermuda. I lived in Somerset at the extreme western end of the island. My dad was Irish and moved to Bermuda to help a relation manage some properties there. I went to school at Sandys Grammer School in Somerset Parish and later at Warwick Academy in Paget Parish. It was in many ways an idyllic place to grow up. 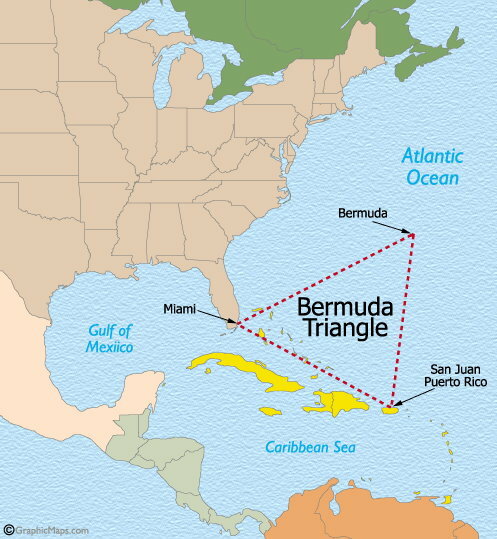 As a child I was not cognizant of just how small an island Bermuda is (20 miles long and about two miles wide at the widest point). It seemed big to me. Our house was situated only a few hundred yards from a beautiful beach on Long Bay, and being in the Gulf Stream the weather was temperate with mild winters and lovely summers. I spent long days exploring beach vegetation, whatever was brought ashore by the waves, and the many tidepools amongst the coral rocks that were filled with fascinating marine life. After my family left to move to the United States, it was fifty years before I once again set foot on Bermuda soil in August, 2007. This was the house I grew up in. It's now part of Cambridge Beaches, one of the most prestigious resort hotels on the island. The year was 1609. The Jamestown Colony was struggling for survival. A fleet was launched by the Virginia Company in England commanded by Admiral Sir George Somers that was intended to resupply the colony with desperately needed food and other provisions. The Admiral was in the flagship, the Sea Venture. Near the little known island of Bermuda, the fleet was battered by a hurricane, and the Sea Venture was separated from its companions. After battling the storm for days, the 300-ton ship was deliberately put onto the rocks in order to save it. All aboard were able to successfully make it ashore, where for the next year they lived on the abundance of food, birds and eggs, fruits, fish, turtles, and wild hogs left by previous Spanish visitors. They stripped the Sea Venture of everything usable and constructed two smaller vessels of Bermuda cedarwood, and the entire ship's company, minus several sailors of a different mind, departed and continued on to Virginia. Sir George Somers returned to Bermuda for more supplies but died there late in 1610. Two years later the first official colonists arrived from England, and Bermuda became a part of the British Empire. tional point along the Atlantic routes. The Royal Naval Dockyard in Somerset was built by the British as a repair and resupply facility for their large men-of-war in the western Atlantic and operated as such until 1951. In the 1970's and 1980's it was converted into a highly successful tourist area with shops, galleries and restaurants, and a cruise ship dock. Gibbs Hill Lighthouse is the oldest lighthouse in the Western Hemisphere, and Somerset Bridge is the smallest drawbridge in the world. The shallow waters around the coastline of Bermuda are the final resting place for dozens of shipwrecked vessels, providing numerous opportunities for snorkeling and scuba diving, while the deeper waters farther out harbor the big fish which attract so many fishermen. It was in fact off the coast of Nonsuch Island in Bermuda that William Beebe and Otis Barton in 1934 went down in the Bathysphere to a world-record depth of 3,028 feet. Bermuda has the oldest continuously-operating parliament in the British Commonwealth, and today, after having rejected a break with England in 1995, maintains its ties with the mother country. Bermuda also passed the first conservation laws in the New World as early as 1616 to protect the cahow (Pterodroma cahow) and other birds. Soon thereafter turtles were brought under the protection of these laws as well. Despite this protection, the cahow was thought to have gone extinct in the mid-1600's and it was not until 1951 that 18 breeding pairs were discovered on an island off the East End, and there are now several hundred in existence. The population of Bermuda is around 63,000. The highest point on the island is 259'. Gibbs Hill Lighthouse, oldest in the Western Hemisphere, and the view across the Great Sound to the city of Hamilton. ways or bridges. Bermuda is a coral limestone cap on the summit of an extinct steep-sided submarine volcano which ascends 12,000' from the ocean floor that first erupted around 110 million years ago and then again around 33 mya and which was created by volcanic activity along the mid-Atlantic Ridge. Bermuda thus has the distinction of being the most northerly coral reef in the world. 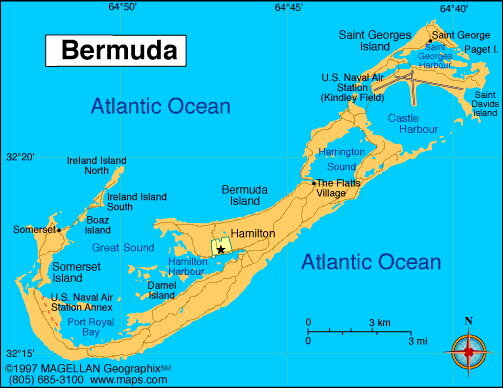 The land area of Bermuda is roughly 20 square miles, and it is surrounded by a shallow reef platform approximately 290 square miles in area. Bermuda's climate is mild and agreeable because of the warming effects of the Gulf Stream. The average annual high temp-erature is around 80°F (27°C), while the average annual low is 65°F (18°C), with temperatures occasionally reaching 90° and 50°. Humidity is high year round (ranging from 71% to 81%) and rainfall is evenly distributed, with no identifiable wet season. August is the hottest and most humid month. Sunshine is very strong and should be protected against. Water temp-eratures range from the mid 60's in the wintertime (when Bermudians definitely do not swim) to around 82 in July and August. August being the most humid month means that it is also the rainiest month, and of course August to October is hurricane season although Bermuda is seldom affected in a major way by such storms. Bermuda receives on average over 50" of rain a year. It is from the sky that most Bermudians receive their water supply. There are no streams or rivers on the island, and although underneath about 20% of the land there is a shallow lens of freshwater which supports wells, all houses collect rainwater on their roofs and channel it to cisterns below. As is not surprising for such a small island, there is very little native or endemic vegetation on Bermuda. 15-17 species are considered to be endemic, that is, they grow nowhere else. 150-165 species are considered native, that is, they came to Bermuda by natural (non-human) means, by water, winds, birds etc. Everything else was introduced by people and has either become naturalized and living on its own or exists as part of and dependent upon a horticultural situation. Nathaniel Lord Britton's Flora of Bermuda, published in 1904, listed 61 endemic species and an additional 95 species for a total of 156 considered to be native. 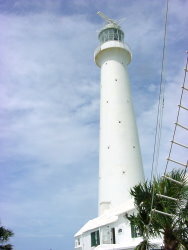 Since Bermuda is for all intents and purposes a warm tropical island, and is blessed botanically speaking by a combination of lots of sunlight, high humidity and ample rainfall, plants from tropical, subtropical and warm temperate areas all over the world have been brought here and thrive here. In addition to protected areas such as Nonsuch Island, Devonshire Marsh, Spittal and Walsingham Ponds, Paget Marsh and Nature Preserve, Warwick Pond and other parks and preserves, there are numerous gardens all over the island from which many exotic species have escaped to live life on their own. In point of fact, Bermuda is like one large botanical garden twenty miles long showcasing many hundreds of species from other parts of the world. The island of Bermuda was originally covered in the main with dense forests of Bermuda cedar (Juniperus bermudiana), and this remained the dominant tree until 1946 when two scale insects were accidentally introduced. Over the next five years 95% of Bermuda's cedars were killed, by some counts approximately eight million trees. Casuarinas, tamarisks and pines were then brought in to create windbreaks, but today the Bermuda cedar is making a good comeback and has regained approximately 10% of its original population. The Bermuda palmetto (Sabal bermudana), Bermuda's only native palm, was another endemic species that undoubtedly fringed the shoreline when the first humans arrived, along with the most northerly mangrove forests in the Atlantic. Regrettably however many of the other endemic species are gone forever. Other common native though non-endemic trees in the pre-settlement Bermuda flora in addition to the red and black mangrove (Rhizophora mangle and Avicennia germinans) were the yellow-wood (Zanthoxylum flavum), buttonwood (Conocarpus erectus) and southern hackberry (Celtis laevigata), all of which survive. The pressures of human habitation over four hundred years and the introduction of many alien species and damaging pests have almost irretrievably affected the ecosystem, and future sea level rise as a consequence of global warming will only add to this.